So I finally got to see Stevie live in the flesh (although he looked like a little speckle of dust on a woolly jumper from where I was sitting). I guess you could say I am one satisfied customer. Despite being a few years shy from blowing out his 60th bday candles, Stevie performed a two hour set that would put most twenty-something wannabes to shame. Unfortunately he didn't sing 'my song', but I hardly noticed because he sang so many choons. 'Knocks me off my Feet', 'Ribbon in the Sky', 'Lately' 'Part Time Lover' (which was really fun due to a little playful sing-off between the boys and girls in the audience), 'All I Do,' 'As', 'Overjoyed' - the set list was simply incredible. During the middle of the show his sweet as pie daughter Aisha Morris sang a beautiful jazz number, and at one point he beckoned Joss Stone who was in the audience to join him on stage to sing 'Signed, Sealed, Delivered'. After waiting so long to see Stevie I left the arena on cloud 9 feeling blissfully happy, positive, and as if I really could hug a hoodie. 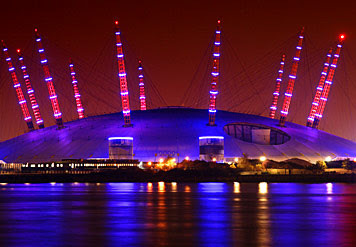 And the 02 Arena is now officially my favourite venue in London, no scrap that, probably the world. Every time I drive up to the approach and see the spacecraft looking venue I feel like an excitable little kid again. In just over a year I've managed to see two of the top artists on my 'concerts to see before you die' list - Prince and Stevie. Fingers crossed, I'll get to see Tina Turner next year. Oooh, and not to mention New Kids on the Block... Yeah I said it!